Trial Set To Start On BP's Responsibility For Gulf Oil Spill : The Two-Way The federal government will seek to show BP was guilty of gross negligence. The company will make the case that the blame should be shared with other firms. It's possible a settlement will be reached. There is speculation about a last minute settlement. 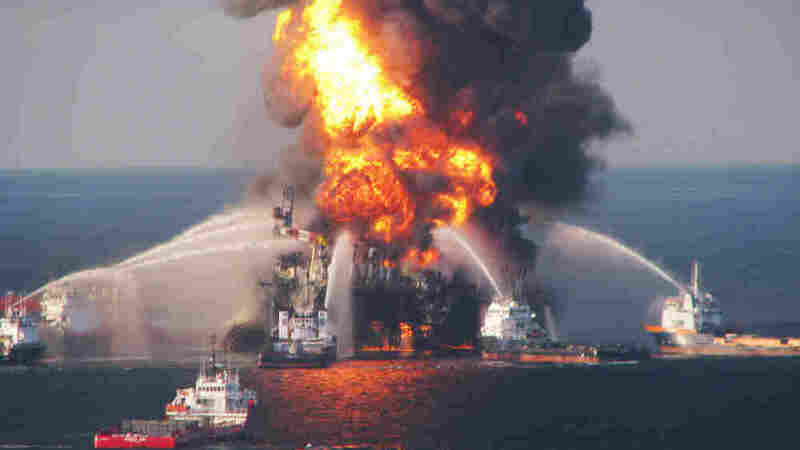 But if that doesn't happen, a federal judge in New Orleans will today begin hearing arguments about BP's liability for the 2010 oil rig explosion and spill in the Gulf of Mexico that killed 11 men and led to one of the biggest environmental disasters in the nation's history. At stake: Billions of dollars in potential penalties. As NPR's Carrie Johnson explained on Morning Edition, federal Justice Department officials say they intend to prove that BP acted with recklessness and is guilty of gross negligence for the series of mistakes that led to the explosion. The company will argue that the blame should be shared with the other firms that performed various roles at the rig. According to The New York Times: On Sunday, "the details of an offer by federal and state officials to the oil company started to emerge. The plan, worth a total of $16 billion, would limit the fines paid by BP under the Clean Water Act to $6 billion, a proposal that could help reduce its tax liability, said one person briefed on the plan who spoke on the condition of anonymity. BP would also pay $9 billion in penalties to cover damages to natural resources as well as the cost of restoration, that person said. The remaining $1 billion would be set aside in a fund that could be tapped if unanticipated environmental damages related to the spill developed." And it could be years before some of those "unanticipated environmental damages" show up, NPR's Debbie Elliott added on Morning Edition. As people on the Gulf Coast can attest, she said, there are still hundreds of miles of oiled shoreland in Louisiana and tar balls still wash up on the beaches of Alabama when there are storms in the Gulf. It could be a couple decades, Debbie said, before all the environmental consequences of the spill are known. BP and other companies that were doing work on the rig have settled some other cases related to the spill. Bloomberg News has a timeline with details.